Tom Ammiano is a former California State Assemblymember. Now Government Relations Adviser at the Palm Center. 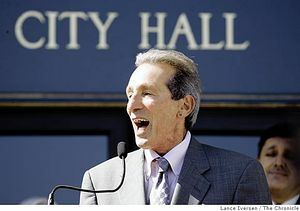 Tom Ammiano is a San Francisco political and "civil rights" leader who has served that city and the LGBTQ community for four decades as a teacher, elected official and comedian. Tom came out as one of the first openly gay teachers in San Francisco in 1975 and has since been at the forefront of reform on many issues including LGBTQ rights, affordable housing, education, labor, immigration, prisons, and marijuana policy. Prior to his election to the California State Assembly, where he was an Assemblymember from 2008 to 2014, he served on the San Francisco Board of Supervisors from 1994 to 2008 and on the San Francisco School Board from 1990 to 1994. He has been a member of the Assembly Coastal Caucus, Environmental Caucus, Golden Gate Bridge Board, Lesbian Gay Bisexual Transgender Caucus, and Metropolitan Transportation Commission. A native of New Jersey, Tom earned his B.A. from Seton Hall and his Masters Degree in special education from San Francisco State University. He taught English to children in South Vietnam as part of a Quaker program until 1968, when he returned to San Francisco to become a public school teacher shortly after the Tet Offensive. In 1975, he became the first public school teacher in San Francisco to make his sexual orientation a matter of public knowledge. In 1977, Ammiano founded the movement (No on 6) against the Briggs Initiative, an effort to ban all gay people from teaching in California, with activists Hank Wilson and Harvey Milk. The anti-Briggs movement was successful in defeating the initiative in 1978. Tom was elected to the San Francisco School Board in 1990, where he served until 1994 and was elected President of the School Board. In 1994, Tom won citywide election to the San Francisco Board of Supervisors. In 2000, after the institution of district elections, Tom was elected District 9 Supervisor, and he represented the Mission District, Bernal Heights and Portola neighborhoods until his election as the Assemblymember for AD-13 in the fall of 2008. He served as President of the Board of Supervisors from 1998 to 2002. In addition to serving on the Board, Ammiano served on the Golden Gate Bridge Board and the Metropolitan Transportation Commission. Assemblymember Ammiano is the Chair of the Assembly Public Safety Committee, a member of the Assembly Education Committee, Health Committee and Human Services Committee. Additionally, he is a member of the State Legislature’s LGBT Caucus and a member of the Environmental Caucus and the Assembly Coastal Caucus. A session of the twice a year Bolshevik Cafe was held in Berkeley, December 4, 1993. The lineup for Dec. 4 is shaping up to be one of the hottest B-Cafes in its 10 year tradition of song, satire and the social part of socialism. Appearing on the program were Tom Ammiano, Francisco Herrera of Grupo Muy Muy and freedom song network members. Members of the Committees of Correspondence Gay & Lesbian Taskforce, participated "with much of the CoC, in the election of Tom Ammiano, a progressive gay activist, and teacher union activist to the City Board of Supervisors". According to Tahnee Stair of the Workers World Party, Fifteen thousand people marched through the streets of Berkeley, Calif., July 31, 1999 chanting: "Whose station? Our station!" The protesters were demonstrating in support of KPFA community radio and the locked-out workers at the station. Buses came from many Northern California cities, bringing people to participate in the show of unity. Marchers demanded that the Pacifica Foundation, which owns KPFA, stop the drive to privatize the 50-year-old, listener-sponsored, progressive radio station. Days before the march, Pacifica management had announced to the media that they would end the three-week worker lockout, lift an ongoing gag rule around the struggle, and turn control of programming over to the Communications Workers union. Despite this announcement, huge crowds came out to support the struggle for "free speech radio." Although mediation was under way, Pacifica Foundation managers simply made an announcement of their terms to the media--not to the workers or community/ union steering committee. The foundation also gave no assurances about future ownership of the station. The announcement was clearly aimed at defusing the growing mobilization for the mass march. It failed. Since April, resistance to Pacific's policy of transforming KPFA into a National-Public-Radio-type mouthpiece for ruling-class interests has sharply increased. Listeners don't want to make the station more acceptable to major corporations--for donations--and to conservative audiences. Popular KPFA staffers were fired. The Pacifica board insisted no one at its stations--which include WBAI in New York--report on the internal struggle. When talk-show host Dennis Bernstein refused to accept this gag rule in early July, management hired goons from IPSA Security to drag him from the station. News that the Pacifica board of directors was discussing selling the station was leaked to the media. A fight-back movement immediately began to grow throughout the Bay Area. It culminated in the mass march. Rally speakers and performers included: spoken word and rap artist Michael Franti from Spearhead; the All Nations Drum; Barbara Lubin of Friends of Free Speech Radio and the Middle East Children's Alliance; Underground Railroad; Rachel Jackson of STORM (Standing Together to Organize a Revolutionary Movement); Andrea Buffa of Media Alliance; KPFA interns Akilah Monifa, Waymon, J. Imani and others; well-known Hip Hop DJ Davey D; San Francisco Mayor Willie Brown and Berkeley Mayor Shirley Dean; and KPFA programmers Miguel Molina, Chuy Varela, Dennis Bernstein, Larry Bensky and Susan Stone. San Francisco Board of Supervisors President Tom Ammiano led the lesbian/gay/bi/trans contingent. Fired station manager Nicole Sawaya was greeted with a standing ovation and thunderous applause when she addressed the crowd. Labor participation was very strong. Farm Workers Vice President Dolores Huerta and California Federation of Labor President Tom Rankin led the union presence. Leaders of the International Longshore and Warehouse Union, Service Employees Local 250 hospital workers, California Nurses Association, Communication Workers Local 9415 representing KPFA workers, and both the Alameda and San Francisco Central Labor Councils expressed solidarity with the struggle to save KPFA. Rosa Peñate and Richard Becker spoke for the International Action Center. Peñate explained that the real aim of the Pacifica board and the forces behind them is "the destruction of progressive media which can mobilize the people for action. We are not fooled and we are not going away. The International Action Center joins with the many other organizations and individuals in the Bay Area and beyond in defending KPFA." Other speakers and co-chairs included Dorsey Nunn of Legal Services for Prisoners with Children, Jeff Mackler of Socialist Action, Alameda County Supervisor Keith Carson Medea Benjamin of Global Exchange, CBeyond, a high school students' organization, and Vic Bedoian, executive director of KFCF radio in Fresno. There was a major march through the streets of San Francisco on March 24, 2002 to mark the 75th birthday of United Farm Workers founder Cesar Chavez. Parade Grand Marshalls included two UFW founders Dolores Huerta, and Cesar's brother Richard Chavez, as well as Rep. Nancy Pelosi. At the march rally UFW Arturo Rodriguez spoke of the continuing legacy of Chavez. Leading with Love was an event to celebrate 5 years of the Marxist led National Domestic Workers Alliance. It was held in Washington DC, DC, November 14, 2012. Members of the Host Committee included Tom Ammiano. In 2013, Assembly Rep Ammiano (D-San Francisco) introduced Assembly Bill (AB) 5, the “Homeless Bill of Rights”. This new Bill of Rights would provide that every person in the state “regardless of actual or perceived housing status, low income, sexual orientation, gender identity, citizenship or immigration status shall be free from specified forms of discrimination and shall be entitled to certain basic human rights, including the right to be free from discrimination by law enforcement, in workplace and while seeking services”. AB 5 also includes the right to access all public property 24 hours a day. If there are public restrooms in a public building, they must be made available at all times. Under this proposed bill, a homeless person who owns any type of vehicle can park in any public parking lot 24/7. If a city provides shelters to homeless individuals, they will not be allowed to gather any personal information such as if they are a citizen or even their gender. The homeless will have the right to rummage through all garbage looking for recyclables or ask for donations in public spaces (otherwise known as panhandling). They may lay, sit and stand in any public space, including sleeping on benches, in transportation stations, parks etc. They would be able to register at a hotel, pay the first night, then claim they are homeless Under this Bill, good luck in trying to remove them without spending a great deal of money and time to do so. If they chose to panhandle or ‘squat’ in front of your business, good luck in having them removed by the Police as legally, they will be helpless to assist you in their removal. If a homeless person’s rights are violated under this act, they can file a civil action. They would be entitled to free legal counsel for any judicial proceedings. Gordon Mar September 26, 2013. CA Domestic Domestic Worker Coalition an, Assemblyman Tom Ammiano & allies celebrate signing of historic dw bill of rights by Gov. Jerry Brown — with Maria Hernandez, Juana Flores, Guillermina Castellanos, Maria Huerta de Reyes and Dmorgan Feris at California State Capitol. With Graham Lewis, David Woo, Arthur Barry Persyko, Gabriel Markoff, Bryce Peppers, Jennifer Bolen, Seamus McGeever, Tom Gallagher, Norman Degelman, Buck Bagot, Rhonda Smith, Gail Packwood-Seagraves, Ilica Mocha, Kyle Smeallie, Debby Rovine, Julian LaRosa, MacKenzie Ewing, Brace Belden, Leslie Gray, Brenden Shucart, Kaylah Paige Williams, Tom Ammiano, Thompson Darcy, Dean Preston, Maya Chupkov, Sunnylyn Ballard Thibodeaux, Otto Pippenger, Jason Barrett Prado, Jen Snyder, Gabriel Medina, Larry-bob Roberts, Sara Shortt, Will Rostov, Theresa Imperial, Riel Fuller, Mark Leno, Jackie Fielder, Ellisa Beth, Avery Yu, Zhihan Zou, Jack LR, Brian Haagsman, Lisa Awbrey, Jackie Prager and Democratic Socialists of America: San Francisco in San Francisco, California. ↑ Workers World, 15,000 defend peoples' radio at KPFA By Tahnee Stair Berkeley, Calif. This page was last modified on 12 March 2019, at 19:25.